Dutch DJ and producer, Daan Romers as known as Dannic has recently spin in Zouk Club Kuala Lumpur. Coming from Breda in the Netherlands, the same hometown as Hardwell, Dannic is one of the hottest acts to have emerged from the new generation of Dutch artists breaking through in recent years. As he started his career with amazing mashups, the name of Dannic has rapidly escalated among the scene since his first solo track “Doster” was released. His productions in the EDM industry has also brought him #26 spot in 2015 DJ Mag Top 100. Dannic is currently signed under the Revealed Recordings and have been with top DJs like Dyro and Hardwell. One of their highlights of collaboration is the Revealed Recordings Canadian Bus Tour that has set to destroy clubs with their electrified beats across the region. 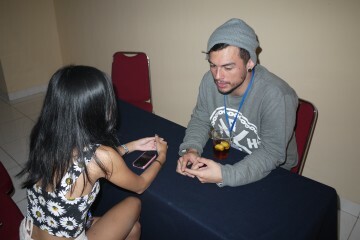 We are pleased to meet him and talk to him about something that the fans might be interested to know about. Concertkaki: We’ve heard about Feel Your Love that you released recently, with Sick Individuals. Could you tell us more about this new track? Dannic: Well, me and the Sick Individuals, we made a track I think in 2013, called Blueprint and it went to Beatport Top 100, number one. Seriously really happy with the track, and our song combined really well. People are really asking “Yo, when it is the next collab coming” but we don’t have time because our career were like blowing up. But then I went to their place once, after I actually arrived at Amsterdam. So straight from the plane, and to their studio, we worked on the track but we weren’t really happy with it. Then, couple of months later they came to my studio and I made a sketch and I had an idea there and we just worked from that. So super happy and it’s different. It has melodic elements, it has the grooves. It was kinda hard and it was harder than I usually made, but it just really works well. Concertkaki: What is it like to be working with Hardwell and Dyro in Revealed Recordings? Dannic: For me, they are one of my best friends. So it’s really ease to work with them. Me and Robert, we have known each other for 11 years and I only met Dyro like 4 years or 3, I can’t remember, time goes so fast, haha. It’s all going so natural, we just best buddies, we always talk about music, always send each other new music. It’s cool to have friends like that. The new track I made with Hardwell “Survivors” we actually I went to his place to play FIFA on PS4, but then we ended up in the studio and we made the track. So ya, I think it’s just all so natural, that’s why the chemistry is there. Concertkaki: Can you tell us something interesting about Front of House? Dannic: Front of House! Which one? The radio show or tv show? Dannic: Both. Well I just needed something like a project to show my fans the real life, like what Dannic is about, what the life of DJ is about, so that’s why I started the web series, Front of House TV. We show everything, like there is no acting going on, so if anything goes wrong, for instance Ultra Miami, I showed that and reactions are really good. It gives people the insight and what is it like to be DJ. And then, my radio show is all about the tracks that I really like. Every 2 weeks, I do my radio show and I really put in a lot effort just to come up with new mashups or select music that people really never heard before and I always try to style a little bit more groovy and end with a little bit hard. Yea, that’s really my style. Concertkaki: Last question, what should we expect from Dannic in 2016? Dannic: Wooh, good question! All my expectations for 2015 are exceeded, already. So I really wanna focus more on making music than I did this year. Erm, because I think it starts with music. That is really important and besides that, I wanna do like more club shows, more intimate club shows because that’s what I really love to do. Also giving people opportunity to see me at the show and not pay like ridiculous amount of money to see me, I think it’s really important. Further than that, just enjoy what I am doing. It’s amazing! Im really thankful for everything. So I wanna thank my fans for that as well.